It might look all pretty on the surface, but don’t be deceived. There’s a fierce and brutal competition going on in local gardens these days. 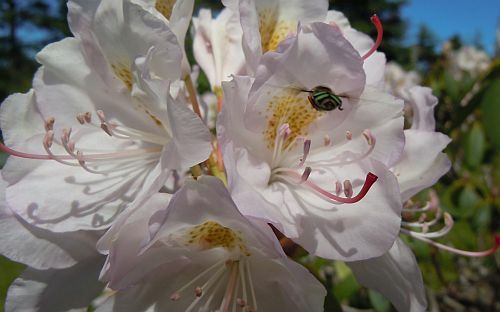 Many plants depend on insects for cross-pollination in order to ensure the survival of their species. With such high stakes, it’s inevitable that some are going to be more successful than others at attracting pollinators to their blooms. Take rhododendrons for example. Locally, it’s difficult to find a residential street where these showy non-native ornamental shrubs are not in bloom this week. What does a plant have to do to get some attention from flying insects? Look bright and beautiful for starters. And this is something rhododendrons do especially well. So well in fact that they distract many pollinators from visiting our less showy native species. 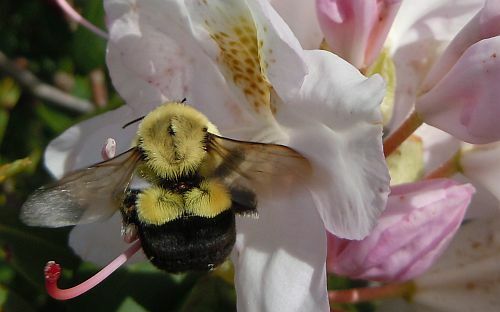 Canadian bees probably haven’t heard about the poisonous ‘mad honey’ that’s created with the nectar of rhododendrons. (See more in Wikipedia’s entry on Grayanotoxin). They simply target the most spectacular blooms and tuck in. 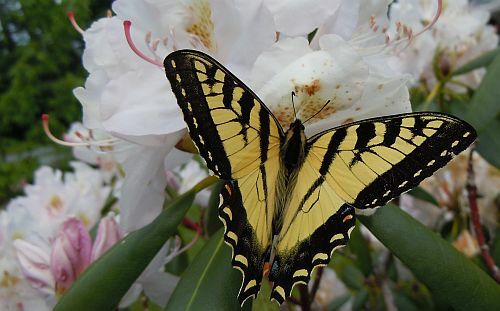 Many gardeners too likely don’t know that the petals and leaves of common rhododendrons are poisonous and can prove deadly to livestock and children if ingested. While attracting a good share of pollinators during the daytime, white flowers also catch the attention of night-flying moths with their subtle scent. What wonderful flying creatures are drawn to these alluring blooms under the moonlight? In many countries around the globe, common rhododendrons are now considered an invasive species as they’ve taken over the natural understory in some forests. 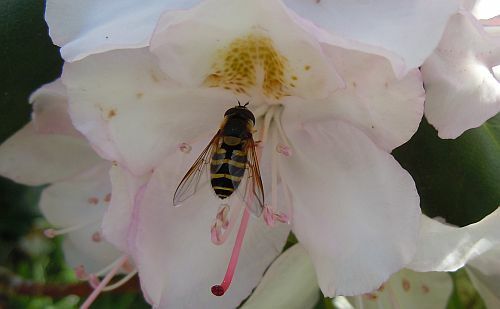 (See the Wikipedia entry on Rhododendron ponticum). In the past year, I’ve found two invasive rhododendrons growing in otherwise wild areas on my property. If they start crowding out the native plants, will I become a rhodi-basher in the years to come? I hope not, but it can be a jungle out there. 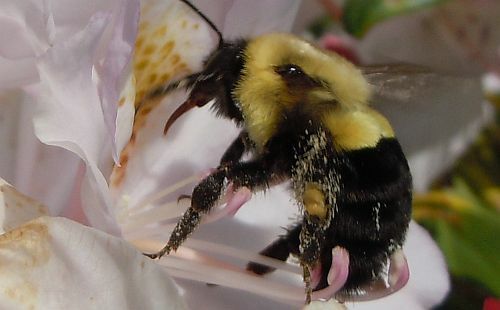 June 18th to the 24th 2012 is International Pollinator Week. Do you know what’s going on in your garden? For more information, see Pollination Canada. Text and photographs copyright Amy-Lynn Bell 2012.